Maybe it's because I grew up in Silicon Valley surrounded by engineers. For whatever reason, I had never met a war veteran face to face. That is, until I met my future father-in-law, "Butch" James Gray. I was nervous meeting him for the first time because I had only seen pictures of him in my boyfriend's photo album. Butch proudly stood next to his pocket knife collection, which was perfectly lined up in several glass displays. He wasn't from Texas, but he didn't seem like someone I wanted to mess with. My bias proved unfounded. From the moment he greeted me with his big bear hug, I knew I had met one of the good guys. What got me curious were the words embroidered across his cap. 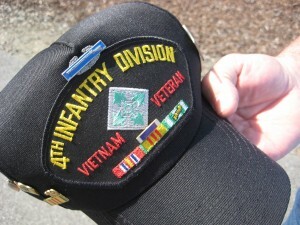 "4th INFANTRY DIVISION VIETNAM VETERAN"
We had a few more family visits out from the Northwest before I got comfortable enough to ask about his thoughts on the war. I grew up in the 80, which meant most of what I knew about Nam were textbook factoids memorized for my History AP tests and scenes from Tom Cruise's awfully depressing flick Born on the 4th of July. Butch is a hard-working, self-made family man. When it comes to his personal stories from the battlefield, he is soft-spoken. I decided to call and find out more. As I peppered him with questions about his military service, I pieced together snippets of courage, sacrifice and honest reflection. As Butch talked about the jungles, fighting the Viet Cong and North Vietnamese without bravado, I couldn't help but draw parallels into my own personal battle -- with hurtful words from my childhood, ministry hardships and my family of origin. I learned that war isn't only waged on land where men fight with artillery and fly overhead with bombs. There is a battle in my soul over the words that have been spoken into my life. God is fighting to free me from the words that harm me, so that I can embrace His words that bless me. 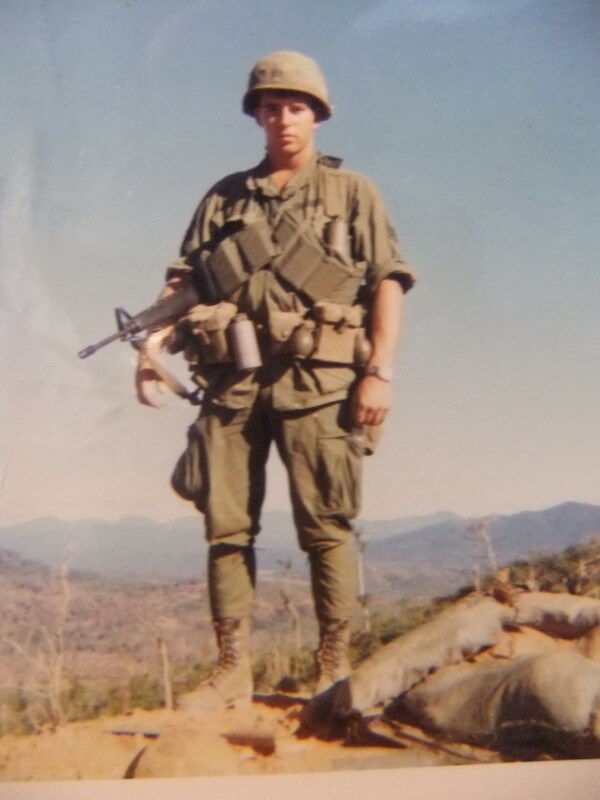 In honor of Veteran's Day, I'm sharing excerpts from Butch's story as an infantry soldier, after he was drafted in 1967 as a 19-year-old, at the time of the Tet Offensive, when our nation deployed the largest number of troops in the history of the Vietnam War. Butch served as Army Sargent in the 4th Division, Rifle Company for two years in the Central Highlands of Vietnam. I'll also share a commentary of internal thoughts from my modern day battlefield with words. As you listen in, I hope you'll be inspired, as I was, to embrace your Abba-given identity as highly blessed and always beloved. 1. So, Dad. If it's okay with you, I'd like to hear more about your time in Vietnam. Butch: Sure. ... Did you hear about the sea lions dying along the Oregon coast? Turns out they have the same disease (leptospirosis) that I got in the jungle over 30 years ago. The doctors thought I had malaria, because it has the same symptoms. You get it from drinking bad water. You think it's okay, but it's infested. You get weak, sweat, perspire, chills. The worse is your whole body shakes. I got so sick I didn't care if I lived or died. Had to get blood tests every day and penicillin shots around the clock for two weeks, lying there in the military hospital in Pleiku. 2. Were you worried you'd die? Butch: Oh yeah. The doctors said they would do their best but that's all they could do. Once I was healed up, they sent me back right away ... forward ... to the front. 3. I can't believe they did that! Butch: Some guys got malaria. The incubation can be eight to 10 years. Then you die. 4. Tell me one of your stories from the frontlines. I'm not familiar with military terms, so tell it to a civilian. Butch: As the patrol leader, I'd take up eight men to look for the enemy and gather intelligence. I had the map, the compass and the codes to interpret coordinates, along with the radio frequencies to keep track of. One time, the company commanders gave me orders to go into A Shua Valley, one of the most deadly places in the country. I spent two to three days reporting observations and information. If needed, I would call in gun ships, jet strikes or artillery. 5. You were deep in enemy territory! Butch: Oh yeah. One time, we traveled on the Ho Chi Minh Trail. We were sent in to disrupt the enemies by planting explosives in trees, so to stop their progress. But the North Vietnamese would only return to clear and open up the trail right away. Felt like a waste of time. 6. You were honored with a Purple Heart. What happened? Butch: We were searching for the enemy, going up a mountain, when we were ambushed. [The enemy] attacked the point guy, so the rest of the patrol ducked for cover. When you don't know where the fire's coming from, you just try to find cover. There was a lot of elephant grass. We ran straight into a booby trap -- pungy sticks -- bamboo knives. Rows and rows of it. You can't walk around it. Camouflaged. 26 guys got wounded in 10 seconds. Just like that. I got a wound in my leg, got some medication for the infection. The next day, they sent me back forward. That's the way [the enemy] wanted it. They'd rather wound us, than kill us. They figured the wounded would hurt us more. 7. You once mentioned it was tough to watch a chopper take off when you were in battle. Talk about courage. What were the conditions like? Butch: One time, we had to get transported. They were trying to evacuate us from a hill. We were out there for two weeks. There was a big insurgence. We were outnumbered. I saw people die, had to care for people who couldn't get medical attention. The choppers can only take a certain number of people. So when you see it take off, you get a sinking feeling. 8. You returned to civilian life without resentment or bitterness about the war, when some did. Why is that? Butch: When you've been some place where people don't have rights, you know how well off you are, because people are willing to sacrifice. The rights of freedom come at a cost. It ain't something someone says is in our constitution. Freedom is something we defend, that citizens sacrifice for. 9. How did you survive countless dangers -- ambushes, watching people die, snakes, leeches, illness -- for so long? Butch: The way my family raised me, they killed my emotions. I had a high tolerance for pain. I don't say anything when I hurt. Sometimes, that's not good. It's a survival technique, I guess (laughs). Way my folks were, we didn't get to express ourselves when something upset us. 10. What is one thing you're most proud about your service? Butch: I did what I asked to do and I'm not ashamed of it. In the end, I was struck by the confidence that spoke through in Butch's ending words. I felt inspired to stand shameless, because no matter what anyone says about me, I know I'm blameless in God's eyes. He knows my heart and I've been faithful to do what He's asked me to do. I am free. What are you battling today? How is God setting you free? By Bonnie Gray, the FaithBarista serving up shots of faith for everyday life. Join Bonnie at http://www.FaithBarista.com, on Facebook or Twitter. Bonnie Gray is an inspiring Christian writer and blogger, offering encouragement to keep faith fresh in the daily grind. Her writing springs from the belief that the beauty of faith often takes place when life goes off script. Bonnie is the Founder of FaithBarista.com and featured writer for Hallmark subsidiary DaySpring's (in)Courage. Bonnie is a native Californian living in the heart of Silicon Valley with her best friend Hubby, wrangling their two heaven-sent boys on the homestead. ** Don't miss! ** If you would like to receive new articles by Faith Barista, click to subscribe by email and get each post in this series served up hot and fresh directly in your mailbox. Free.